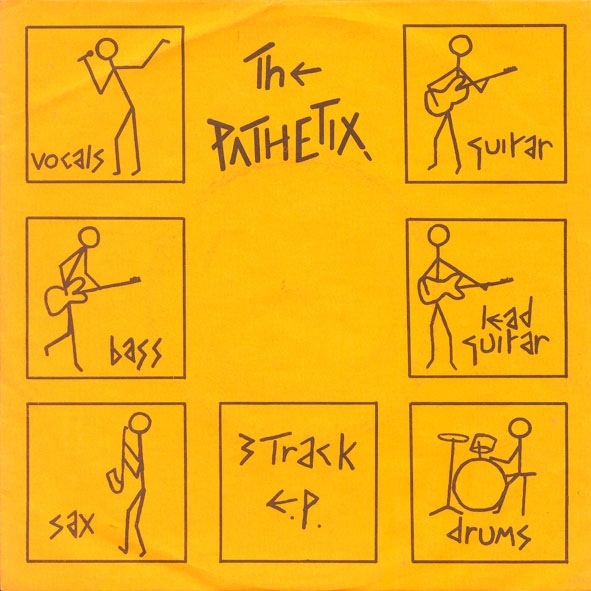 The Pathetix were formed in Nelson, Lancashire, sometime in 1976. Their first single, ‘Aleister Crowley’, was released in 1978 on the ‘No’ label. Everything about this single ouses punk-rock goodness: the day-glo cover, the X substituted for an S, scratchy cover art…really, what more do you want? Positive reviews in the music press and encouraging words from Peel, led to Rough Trade taking 500 copies of the single for distribution and the band enter the indie chart for a week or two. I can vaguely remember hearing Peel playing the single. A slightly sinister sound (and who is this Crowley bloke anyway?) a creeping sax, maybe a little long at 5 minutes but what the hell. A couple of years later I spot it in a 10p box and gleefully take it home. I hadn’t heard the record for ages and it still sounded good. A few decades later (i.e. last summer) I have just re-purchased a record player and pick the single out of my singles box, I hadn’t heard it since the 80s, had it stood the test of time? I’m glad to say it has. It still sounds unusual, it still sounds sinister, the cover still looks great. This is the single insert. If you want to dig deeper into the band there’s an excellent article on the Bored Teenager’s site, well worth a read.